This perfect choice for refurbishment projects in heritage and conservation areas, rejuvenating public spaces and enhancing driveways. A quick and easy to install system that creates an attractive, highly durable surface, ideal for all traffic types. Specifically formulated for use in resin bonded surfacing, our Adtex, resin bonded systems, are easy to install. Simply apply the resin binder to a base surface, such as asphalt or concrete, then broadcast a layer of specifically selected, natural aggregates over the wet resin. The wide range of aggregate colors and shapes available offers the potential to introduce design elements. We also have a range of color pigment packs that can be added to the binder, to add a splash of color to the finished system. 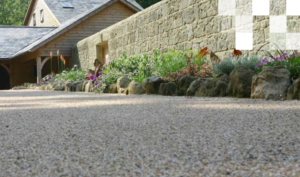 Aftercare isn’t always necessary for resin bonded paving, although it is normal for the surface to shed loosely bonded aggregate for a period of time after application, this can just be swept away. Loose debris such as leaves and mud should be removed as soon as possible either by a light pressure washing or sweeping. 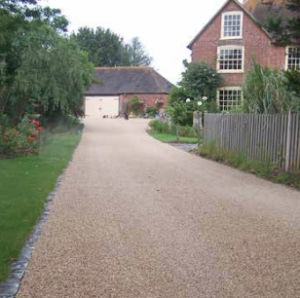 We also supply an easy to apply, glaze coat for resin surfaces that will rejuvenate and protect the surface. Our Adtex resin bonded binder is part of a new generation of specialist two part, solvent-free polyurethane resins. Like our GeoPaveX resins, Adtex shares many of the same environmental benefits, primary being sustainable and derived from natural resin. The Geveko Markings hybrid resin system is designed specifically by their team of chemists and has undergone extensive testing and development to provide our applicators with and industry beating solution which is not only very easy to apply but offers a very high strength binder for bonded applications. The resin binder is supplied in a neutral amber color to compliment our aggregate, however the binder can also be colored with the use of pigments where additional color is required.